The Smilodon was commonly called the saber-toothed tiger or saber-toothed cat. Smilodon means "knife tooth". These fierce predators were about 4-5 feet long and about 3 feet tall. The average weight was about 440 pounds. It's legs were made for sprinting to catch prey, but it was not a fast runner. Their skull was about 12 inches long and had 2 huge serrated canines. These canine teeth were about 7 inches long. Their jaws opened to about 120 degrees. Today's lions can only open their jaw to about 65 degrees. The Smilodon is definitely most noted for it's two large canine teeth. Bone structure between male and female is not known, but can be assumed that the female had wider cavity in the hips to allow for birth. Nobody can know how the Smilodon reproduced because the animal is extinct but it can be assumed that it reproduced like any other large cat. Sexual reproduction and live birth are the only things that are assumed on reproduction for a saber-toothed cat. 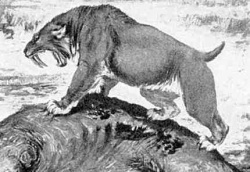 We cannot be certain of when the Smilodon lived but the basic evolutionist fact was that it lived about 1.6 million years ago and became extinct about 11,000 years ago. 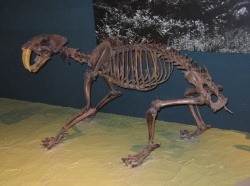 The saber-toothed cat lived during the ice age. Most of the animals that were in the ice age have become extinct due to the pressures of major climate change and human hunting. Their habitat was in grasslands, shrubby areas, and pine forests that supported the plant-eating animals that saber-tooth cats ate. The Smilodon was a carnivore that most likely ate Mastodons, horses, and bison. Computer Generated Graphics of 3 Saber-toothed Tigers fighting. Smilodon. Wikispecies. Web. 7 November 2010. Author Unknown. McCall, Sherman; Naples, Virginia; Martin, Larry. Assessing Behavior in Extinct Animals: Was Smilodon Social?. Sno-Isle. Web. January 3 2003. Smilodon. Wikipedia. Web. 30 January 2012. Many Authors. All About Smilodon Meaning "Knife Tooth". Enchanted Learning. Web. Accessed January 30, 2012. Author Unknown.